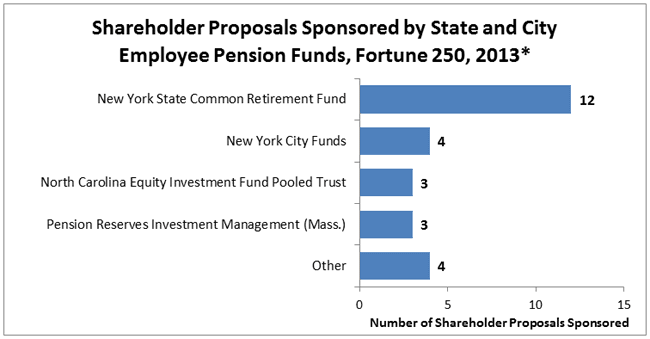 Public-employee pension funds, led by New York City and State, assume a leading role in sponsoring shareholder proposals. The Manhattan Institute’s ProxyMonitor.org database, launched in 2011, is the first publicly available database cataloging shareholder proposals and Dodd-Frank-mandated  executive-compensation advisory votes at America’s largest companies. This is the 19th in a series of findings and reports drawing upon information in the database, each of which examines shareholder activism in which investors attempt to influence corporate management through the shareholder voting process. The well-publicized shareholder vote challenging JPMorgan Chase to strip Jamie Dimon of his joint chairman and chief executive role—turned back by a resounding 68 percent of shareholders—was led by four investors representing union-related pension funds: the pension for the American Federation of State, County, and Municipal Employees (AFSCME), the New York City Comptroller’s Office, the Connecticut Retirement Plans, and Hermes Fund Managers (a socially responsible investment vehicle owned by the BT Pension Scheme, serving the retirees of the British telecommunications giant). The JP Morgan fight is but one example of the major role that union-affiliated pension funds, and public employee pension fund managers in particular, play in the capital markets. With hundreds of billions of dollars under management, pension funds for the retired employees of large states and municipalities such as New York City and State, California, and Florida are not only among the nation’s largest investors but also leaders in the variant of shareholder activism attempting to influence corporate behavior by introducing and advocating for shareholder proposals on companies’ proxy statements. Such shareholder activism is generally rare among the broad range of institutional investors: only 1 percent of all shareholder proposals introduced at Fortune 250 companies since 2006 have been sponsored by institutional investors that lack an affiliation with organized labor or an express “social investing,” religious, or public policy purpose. Labor pension funds, however, play a leading role in such activism, having sponsored a plurality of all proposals—one-third of the total—introduced over the time span. Private-sector labor funds, such as those affiliated with the AFL-CIO, the Teamsters, and the electrical workers’ and carpenters’ unions, have historically sponsored a majority of such proposals. Through 2012, pension funds for state and municipal workers sponsored 26 percent of all union-affiliated shareholder proposals. In each of the last two years, however, the share of union-affiliated proposals sponsored by state and municipal funds has jumped to 38 percent. In 2013, state and local pension funds have introduced more shareholder proposals than those representing private-sector workers. This report examines the role that state and municipal pension funds have played in the shareholder proposal process. The report begins with an overview of such activity and then turns to a more in-depth analysis of the activism of the pension funds for New York State (the most active fund in 2013), New York City (the most active fund over the last eight years), and California (the largest public-employee pension fund and a historical proponent of social-issue-oriented shareholder activism). The report concludes with an analysis. In 2013, the New York State Common Retirement Fund has been the most active institutional investor introducing shareholder proposals at large public companies. 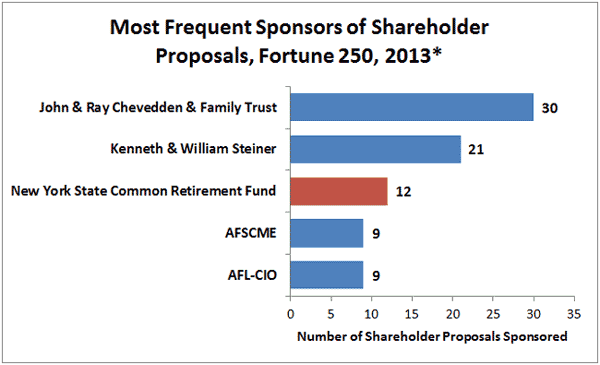 Only prominent “corporate gadflies” John Chevedden and William Steiner, along with their family members and trusts, have sponsored more shareholder proposals this year at Fortune 250 companies. 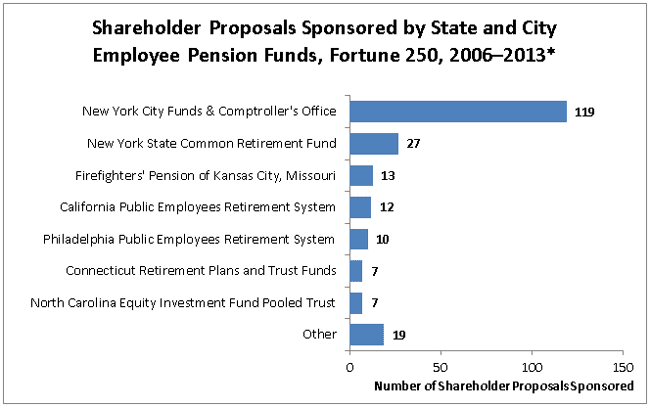 Other state and municipal public-employee pension funds introducing multiple shareholder proposals in 2013 are pensions for the workers of New York City, Massachusetts, and North Carolina. *To date, 194 of 250 companies have filed. While the New York State fund has sponsored 12 of 26 shareholder proposals introduced by public-employee funds this year, its leading role in the shareholder proposal process is relatively recent: the fund introduced no proposals at a Fortune 250 company from 2006 through 2009, but it has steadily increased its shareholder proposal activity since then. In the last eight years, the most active public-employee-fund sponsors of shareholder proposals have been the New York City pension funds, including the office of the elected city comptroller. Since 2006, the New York City funds have backed 119 of the 214 proposals sponsored by state and city employee pension funds at Fortune 250 companies. *2013 filings to date; 194 of 250 companies have filed. 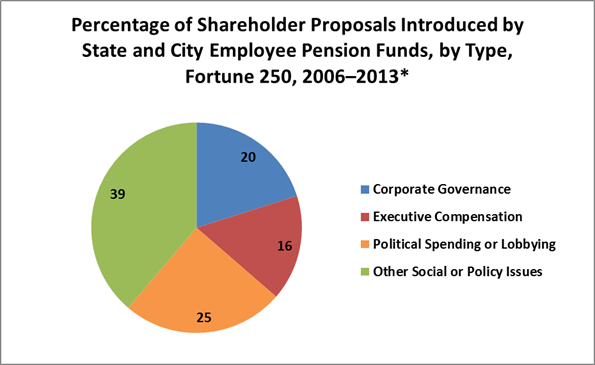 Public-employee pension funds have varied in the type of shareholder proposal that they have sponsored, though they have generally been much more likely to sponsor proposals related to social or public-policy issues unrelated to corporate governance or executive compensation—such as those involving the environment, corporate political spending or lobbying, and human rights—than have other shareholders. Social and policy issues have been the focus of only 38 percent of shareholder proposals sponsored by investors generally dating back to 2006 but 64 percent of all shareholder proposals sponsored by state and local employee pension funds. Of all state and local employee pension funds’ proposals, 25 percent have related to corporate political spending or lobbying. Within that broad trend, focus has varied. A total of 89 of the New York City funds’ 119 proposals have involved social or policy issues, as have 26 of the 27 proposals backed by the New York State fund and 9 of 13 of those backed by the Kansas City firefighters’ fund. In contrast, 6 of the 7 proposals sponsored by the North Carolina fund have sought board declassification, 8 of the 12 proposals sponsored by the California Public Employees Retirement System (CalPERS) have sought to require directors to be elected by majority vote, and a majority of the Connecticut and Philadelphia funds’ proposals have involved executive compensation. The sole trustee of the $160 billion New York State Common Retirement Fund is a publicly elected official, the state comptroller, currently Democrat Thomas P. DiNapoli. A lifelong politician with no previous investment-management experience, DiNapoli was selected for his position by the state legislature in 2007 after the incumbent comptroller, Alan Hevesi, pleaded guilty to a felony fraud count and resigned. Controversially, the legislature’s selection of DiNapoli, then a member of the state assembly, violated legislative leaders’ prior commitment to choose a comptroller from among a short list of qualified candidates vetted by a screening committee. DiNapoli narrowly won reelection in 2010, notwithstanding that The New York Times endorsed his Republican opponent, Harry Wilson; DiNapoli secured the endorsement of at least 20 labor groups in the campaign. The year 2010 was the first, dating back to 2006, in which the New York State Common Retirement Fund introduced shareholder proposals at companies in the Proxy Monitor database. The fund’s two proposals that year asked ExxonMobil to amend its employment-discrimination policies and American International Group (AIG) to submit its political spending to an annual shareholder vote. Since that time, the New York State Common Retirement Fund has been increasingly active. In general, the New York State fund’s shareholder proposal submissions have not been related to increasing shareholder value: 17 of the fund’s 27 sponsored proposals have involved corporate political spending or lobbying, five have involved environment-related concerns, four have involved employment nondiscrimination policy, and one has involved executive compensation. No proposal sponsored by the New York State fund has received the backing of a majority of shareholders. Typical are the proposals submitted to ExxonMobil (XOM) and Anadarko Petroleum (APC), the only two companies facing more than two shareholder proposals from the New York fund over the four-year period. The four proposals submitted by the New York State fund to ExxonMobil shareholders, introduced in 2010, 2011, and 2012, and 2013 each called for the company to add sexual orientation and gender identity to its equal-employment-opportunity policy—a concern that, whatever its merits, has little bearing on shareholder returns. The fund’s three proposals sponsored at Anadarko, in 2011, 2012, and 2013, each called on the company to issue a report on its political spending. The special focus on Anadarko is unlikely due to a perceived adverse impact of the company’s political spending on its performance: over the leading three-year period corresponding to the introduction of these three proposals, Anadarko’s share price has outperformed that of its competitors. Instead, DiNapoli’s focus on Anadarko is likely political: the company gave 90 percent of its $244,500 in political action committee federal-candidate donations in 2012 and 79 percent of its $310,500 in 2010 PAC donations to Republican candidates. In 2013, the New York State fund introduced its first non-social-policy-related shareholder proposal at Abbott Laboratories (ABT), seeking to adjust the company’s incentive-compensation metrics. Abbott faced six labor-backed shareholder proposals in 2012—the most of any Fortune 250 company—and it faced five labor-backed shareholder proposals again this year at its April 26 annual meeting, including a lobbying-related proposal sponsored by AFSCME, executive-compensation-related proposals by the AFL-CIO and Marco Consulting Group (the leading investment consultant to American union funds) and a corporate governance-related proposal sponsored by the International Brotherhood of Electrical Workers. As was the case in 2012, it seems unlikely that these union-affiliated funds are targeting Abbott because of concerns about its performance: the company’s stock appreciated 19.1 percent in 2012, significantly better on average than that of its competitors. Thus, labor funds’ special focus on Abbott is most likely attributable to Abbott CEO Miles White’s public support for state-level changes to public-employee unions’ bargaining rights. None of the labor-fund proposals introduced at Abbott received majority shareholder support. The shareholder proposals sponsored by the New York State fund that show up on proxy ballots only partly reflect the increasingly active role that the fund and DiNapoli have played in advancing an agenda unrelated to share value. In many cases, companies hoping to avoid the expense and publicity of responding to a shareholder ballot proposal will negotiate with proposal sponsors to accommodate their wishes—as did the retailers Best Buy and Bed Bath & Beyond earlier this year, in agreeing to promote “sustainable business practices” with their suppliers in exchange for the New York State Common Retirement Fund’s agreeing to withdraw shareholder proposals advocating that idea. In some cases, companies will accommodate activist shareholders’ wishes even against the express desires of an overwhelming majority of all shareholders: Pepsico agreed to disclose lobbying and trade association ties so that DiNapoli would withdraw the New York fund’s 2013 shareholder resolution to that effect, notwithstanding that a shareholder proposal introduced at Pepsi last year seeking such disclosure won the support of only 7.1 percent of shareholders voting. In 2013, DiNapoli has also taken to the courts in pursuit of his political-spending-disclosure agenda, filing suit against Qualcomm in Delaware state court before the company agreed to certain disclosures in settling the suit on February 22. 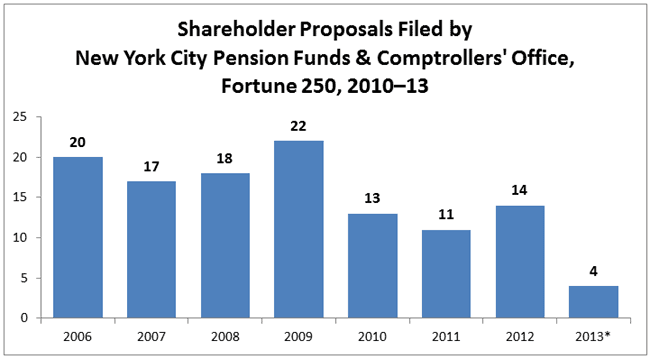 While the New York State Common Retirement Fund has been the most active public-employee pension fund in sponsoring shareholder proposals in 2013, the dominant role in state and local pension fund activism historically has been played by the New York City funds and comptroller’s office, which pioneered such shareholder activism in 1980s, leading efforts to divest from companies doing business in South Africa. In contrast to the New York State structure, the City’s elected comptroller—currently Democrat John Liu, who was elected with the endorsements of all the City’s most powerful labor unions—is only one of several trustees, spread across independent boards overseeing five different pensions with a collective $130 billion in assets. Board members tend to be political officials or union delegates: the board of the $46 billion Teachers Retirement System (TRS) includes the comptroller, two mayoral delegates, a delegate from the education chancellor, and three teacher delegates; whereas the board of the $43 billion New York City Employees’ Retirement System (NYCERS) includes the comptroller, the public advocate, a mayoral representative, each of the five New York City borough presidents, and three union delegates. Among the 119 shareholder proposals sponsored by the New York City funds since 2006, 14 have involved corporate-governance concerns, 16 executive compensation, and 89 social or policy issues. Among the last group, 25 involved employment nondiscrimination policies (18 calling on companies to adopt nondiscrimination policies regarding sexual orientation and gender identity, and seven calling on companies doing business in Northern Ireland to adopt the MacBride principles of nondiscrimination), and 20 involved corporate political spending or lobbying. Six of the New York City funds’ proposals have received majority shareholder support: a 2007 proposal at Lear asking the board to adopt a majority-voting standard for directors, a 2010 proposal seeking to declassify Capitol One’s board, a 2010 proposal at Sprint Nextel seeking a shareholder advisory vote on executive compensation, a 2010 proposal seeking limits on change-of-control payments at R. R. Donnelly & Sons, a 2011 proposal asking KBR to change its equal-employment-opportunity policy to explicitly prohibit discrimination based on sexual orientation, and a 2012 proposal asking Chesapeake Energy to adopt a bylaw granting proxy access to certain shareholders who want to nominate their own directors. In general, under Comptroller Liu’s tenure, the New York City funds have sponsored fewer shareholder proposals than they did under his predecessor, William Thompson, who served through 2009. In 2013, the New York City funds have been much less likely to serve as lead sponsors for shareholder proposals, sponsoring only four to date: a proposal asking Motorola to publish an annual “sustainability” report (which received the support of approximately 5 percent of shareholders at the company’s May 6 meeting) and a proposal asking Aetna’s board to separate its chairman and CEO positions (which 33 percent of shareholders supported at the company's May 17 meeting); a proposal asking Omnicom to prepare “workforce diversity” reports (which 26 percent of shareholders supported at the company’s May 21 meeting); and a proposal asking ExxonMobil to prepare shareholder reports on natural gas fracking (to be presented at the company’s May 29 meeting). The New York City funds have been cosponsors of other proposals—including the much publicized effort to separate the chairman and CEO roles at JPMorgan Chase Whether the New York City funds’ decision to avoid lead sponsorship of shareholder proposals in 2013 reflects a change in their corporate-governance strategy or whether it is related to Comptroller Liu’s prospective 2013 mayoral candidacy (sullied by the indictment of his former campaign treasurer for allegedly funneling money from straw donors into the campaign), the funds’ posture in 2013 is clearly different. Nevertheless, neither Liu nor the New York City funds have backed away from a broadly shareholder-activist posture. In addition to pursuing the chairman and CEO of one of the city’s largest employers, JPMorgan Chase, the New York City funds took the unusual action of calling on the SEC to take enforcement action against Nabors Industries after the commission rejected the company’s 14a-8 no-action request premised on the funds’ misleading proxy-access shareholder proposal. Liu has also publicly touted his role in strong-arming AIG, Bank of New York Mellon, and US Bancorp into publicizing workforce-diversity data—which he claimed credit for encouraging last year at Goldman Sachs and MetLife. Again, the shareholder proposal process is often but a means to an end of pressuring corporations to modify their behaviors. California’s mammoth $255 billion public-employee pension fund is governed by a board composed of political appointees, ex officiopolitical figures, and union delegates. Like the New York State fund, CalPERS has been rocked by a self-dealing scandal, in which its former CEO was recently indicted. And like the New York City funds, CalPERS has long been known for its shareholder activism. Phil Angelides, the union-backed state treasurer from 1999 through 2007, publicly announced that he wanted to “mobilize the power of the capital markets for public purpose.” The fund adopted “social responsibility” standards in 2000—and by 2011, “CalPERS had adopted 111 different policy statements on the environment, social conditions, and corporate governance, all dictating or restricting how its funds could be invested.” This social-responsibility focus may be at least partly responsible for the fund’s anemic returns. Its activist posture notwithstanding, CalPERS has been a relatively small player in introducing shareholder proposals: the 12 that it sponsored from 2006 to the present is fewer than the number proposed by the tiny firefighters’ pension of Kansas City, Missouri. Moreover, unlike the New York funds, which focus their shareholder proposal activism on social and policy concerns, CalPERS has introduced proposals only plausibly related to share value or, at least, making boards more responsive to shareholder concerns: since 2006, CalPERS has introduced eight proposals at Fortune 250 companies calling on the board to require majority shareholder support for directors’ election, in addition to one proposal each seeking board declassification, shareholder advisory votes on executive compensation, a modified executive severance pay policy, and proxy access. In keeping with its focus on director-election standards, CalPERS’s most public corporate-governance efforts this year involve its efforts to oust what the fund’s representatives call “zombie directors”—directors who stay on corporate boards despite not winning a majority of votes cast. In essence, CalPERS’s position seems to be that “majority voting” for directors should be an immutable corporate-governance rule even when not adopted by companies’ shareholders; and that proxy-access rules are necessary to facilitate director challenges. Because of the fund’s focus on social-responsibility factors and because its public challenges to directors have focused on executive-compensation questions, rather than stock-price performance, CalPERS’s unrelenting focus on director-election standards is open to criticism as being motivated by concerns other than shareholder return—the very issue raised by the D.C. Circuit in rejecting the SEC’s proposed proxy-access rule. The large role in corporate governance being exercised by state and city public-employee pension funds is troubling on several levels. For private pension funds, the federal Employee Retirement Income Security Act (ERISA)  requires that fund managers "consider only those factors that relate to the economic value of the plan's investment," and they are expressly forbidden to "subordinate the interests of the participants and beneficiaries in their retirement income to unrelated objectives." (That private-union-affiliated pension funds' involvement in the corporate-governance process has conformed to these norms has been questioned by the D.C. Circuit Court of Appeals, the Office of the Inspector General of the U.S. Department of Labor, and academic studies.) State and local government plans, however, are exempt from ERISA, and some have expressly endorsed using non-economic factors in investing. As mentioned above, former California state treasurer Phil Angelides publicly endorsed the idea of using the California pension funds' stock ownership to facilitate his conception of a "public purpose," rather than to maximize share return. Beyond the legal requirements, if state and local pension funds’ shareholder activism is not adding to share value, it is undermining the fiscal solvency of funds that are generally underfunded—and ultimately the taxpayers’ responsibility. New York City’s largest pension funds posted dismal 1.9 percent and 1.3 percent returns in the most recent fiscal year and have trailed their benchmarks over three- and five-year windows. City pension expenses totaled $7.8 billion in 2012—12 percent of the City’s budget—up from $1.5 billion in 2001. The New York State fund has done better—but only by aggressively allocating a maximum-allowable 70 percent of its assets to equities. From 2010 through 2014, required employer pension contribution to the New York State pension fund rose from 15 percent to 29 percent of salaries for police and fire employees and from 7.4 percent to 21 percent of salaries for other workers. This prompted Governor Andrew Cuomo to propose a controversial pension “smoothing” option for local governments, which DiNapoli countered by expanding his existing plan allowing employers to defer a portion of their pension contributions. CalPERS performed better in its most recent fiscal year, rebounding from an anemic 1.1 percent in 2011, but its five-year average trailed 99 percent of large public pension funds, according to a recent report by Wilshire Consulting. California municipalities faced a 50 percent hike in pension contributions in 2013 necessary to close $87 billion in CalPERS’s unfunded obligations. A 2002 study published in the Journal of Financial Economics found that companies in which public-employee pension funds held large ownership stakes had lower valuations than those with larger ownership stakes by private pensions, and that this effect was more pronounced when the public pension fund was activist in orientation—and particularly so if the public fund focused on social concerns. Such results are unsurprising, given that institutional investors without a labor affiliation or social-investing purpose almost never introduce shareholder proposals—ipso facto evidence that they generally question the utility of this variant of shareholder activism. Even the large New York State Common Retirement Fund is “ ‘thinly staffed’ for such a large and complex fund, especially in several asset classes,” according to the independent advisory firm Funston Advisory Services. It is implausible that the fund’s politically oriented shareholder proposal activity is carefully crafted to add share value—let alone the efforts of much smaller funds, such as the Kansas City firefighters’ pension, which has less than 0.5 percent of the New York fund’s assets. Margaret M. O’Keefe, project manager for the Manhattan Institute’s Proxy Monitor effort, assisted in the preparation of this report. Pub. L. No. 111-203, 124 Stat. 1376, §951 (2010). See Proxy Monitor, Reports and Findings, http://www.proxymonitor.org/Forms/reports_findings.aspx. James R. Copland, Proxy Monitor 2012: A Report on Corporate Governance and Shareholder Activism, 8 (Manhattan Inst. for Pol’y Res., Fall 2012). The New York State Common Retirement Fund holds assets in trust for the New York State & Local Retirement System (NYSLRS), which includes the Police and Fire Retirement System (PFRS) and the Employees' Retirement System (ERS). The fund does not provide for teacher pensions, which are separately managed by the New York State Teachers' Retirement System (NYSTRS). “Corporate gadflies,” as commonly used in Charles M. Yablon, Overcompensating: The Corporate Lawyer and Executive Pay, 92 Colum. L. Rev. 1867, 1895 (1992); see also Jessica Holzer, Firms Try New Tack against Gadflies, Wall. St. J. (June 6, 2011), http://online.wsj.com/article/SB10001424052702304906004576367133865305262.html. See Office of the State Comptroller, Fiduciary Responsibilities of the Comptroller, http://www.osc.state.ny.us/pension/fiduciary.htm (last visited May 22, 2013); see also Press Release, The Office of the New York State Comptroller Thomas P. DiNapoli, DiNapoli: State Pension Fund Valued At All-Time High Of $160.4 Billion (May 13, 2013), http://www.osc.state.ny.us/press/releases/may13/051313.htm. See Danny Hakim, Thomas P. DiNapoli, a Nice Guy Who Wound Up Finishing First, N.Y. Times (Feb. 8, 2007), available at http://www.nytimes.com/2007/02/08/nyregion/08man.html?_r=1&; see also Michael Cooper, Hevesi Resigns, Pleading Guilty to Fraud Count, N.Y. Times (Dec. 22, 2006), available at http://www.nytimes.com/2006/12/22/nyregion/22cnd-hevesi.html?_r=0. See Jen Chung, Everyone Loses With DiNapoli As Comptroller, Gothamist (Feb. 8, 2007), http://gothamist.com/2007/02/08/dinapoli_is_com.php. See Sam Dolnick, Thomas DiNapoli Re-Elected Comptroller in a Tight Race, N.Y. Times (Nov. 3, 2010), available at http://www.nytimes.com/2010/11/03/nyregion/03nycomptroller.html. See Editorial, For New York Comptroller, Attorney General, N.Y. Times (Oct. 15, 2010), available at http://www.nytimes.com/2010/10/16/opinion/16sat2.html?_r=0. This report’s author, James R. Copland, owns shares in the securities of ExxonMobil as part of a diversified investment portfolio. APC’s shares rose 25.4 percent from the end of 2009 through the end of 2012, as compared with Halliburton (HAL), +21.8 percent; Schlumberger (SLB), +10.6 percent; and Chesapeake Energy (CHK), –32.8 percent. In addition to outperforming its peers across the three-year period, Anadarko outperformed them on average in each year of the period—though it returned less than Halliburton and Schlumberger individually in 2010 and 2012. This report’s author, James R. Copland, owns shares in the securities of Anadarko and Schlumberger as part of a diversified investment portfolio. OpenSecrets.org, Influence and Lobbying, 2012 Summary: Anadarko Petroleum, http://www.opensecrets.org/orgs/summary.php?id=D000000459 (last visited May 22, 2013); see also Copland, supra note 3, at 16-17. See Copland, supra note 3, at 17. See The Marco Consulting Group, MCG Rated Top Investment Consultant to Union/Taft-Hartley, http://www.marcoconsulting.com/news/top-investment-consultant-uniontaft-hartley-clients (last visited May 22, 2013). By comparison, Pfizer (PFE) returned +19.7 percent; GlaxoSmithKline (GSK), –3.3 percent; Merck (MRK), +9.7 percent; and Novartis (NVS), +11.6 percent. This report’s author, James R. Copland, owns shares in the securities of Merck and Pfizer as part of a diversified investment portfolio. See Copland, supra note 3, at 17, citing Edward McClelland, Basic Union Busting, NBC Chicago (Oct. 13, 2011), http://www.nbcchicago.com/blogs/ward-room/Basic-Union-Busting-131252434.html. Copland, Political Spending, Say on Pay, and Other Key Issues to Watch in the 2013 Proxy Season (Manhattan Inst. for Pol’y Res., Winter 2013), http://www.proxymonitor.org/Forms/pmr_05.aspx. See Press Release, The Office of the New York State Comptroller Thomas P. DiNapoli, DiNapoli: Best Buy and Bed Bath & Beyond Agree to Promote Sustainable Business Practices With Suppliers (Mar. 29, 2013), http://www.osc.state.ny.us/press/releases/mar13/032913.htm. See Press Release, The Office of the New York State Comptroller Thomas P. DiNapoli, DiNapoli: PepsiCo to Disclose Lobbying and Trade Association Ties (Mar. 15, 2013), http://www.osc.state.ny.us/press/releases/mar13/031513.htm. This report’s author owns shares in Pepsico as part of a diversified investment portfolio. See Dan Strumpf, Qualcomm Settles Disclosure Suit with New York, Wall St. J. (Feb. 22, 2013), http://online.wsj.com/article/SB10001424127887323549204578320500077425818.html; see also Copland, supra note 19. See Aaron Elstein, Liu cuts to the Chase, Crain’s (Apr. 14, 2013), http://www.crainsnewyork.com/article/20130414/POLITICS/304149974. See id. ; see also New York City Comptroller John C. Liu, Pension Funds, Overview of the NYC Public Pension Funds, http://www.comptroller.nyc.gov/bureaus/bam/pension_funds.shtm (last visited May 22, 2013). See Teachers’ Retirement System of the City of New York, Our Retirement Board, https://www.trsnyc.org/trsweb/aboutUs/ourRetirementBoard.html (last visited May 22, 2013). See NYC Employees’ Retirement System, Board of Trustees, http://www.nycers.org/%28S%284wrsjxi1mhx2ru45mnycd445%29%29/about/Board.aspx (last visited May 22, 2013). Motorola Solutions' CEO Hosts 2013 Annual Meeting of Stockholders, Seeking Alpha (May. 6, 2013, 21:10), http://seekingalpha.com/article/1407511-motorola-solutions-ceo-hosts-2013-annual-meeting-of-stockholders-transcript?page=5. See JPMorgan Chase & Co, Definitive Proxy Statement Pursuant to Section 14(a) of the Securities Exchange Act of 1934, proposal 6 (2013), http://www.sec.gov/Archives/edgar/data/19617/000001961713000255/jpmc2013definitiveproxysta.htm#s5F565B3CE6189A603874A810F3791135. See Elstein, supra note 23. See Pamela Park, Corporate governance watch: NYC Pension Funds seeks SEC enforcement action against Nabors Industries, Westlaw (Apr. 22, 2013), http://currents.westlawbusiness.com/Article.aspx?id=58d0b97e-e093-42e0-9b2a-34cbd2b90aa4&cid=&src=&sp=. See Zachary Tracer, AIG to Release Diversity Data After Pressure From Liu, Bloomberg (Apr. 9, 2013), http://www.bloomberg.com/news/2013-04-09/aig-to-release-diversity-data-after-pressure-from-liu.html. See Karen Gullo & Michael B. Marois, Ex-Calpers CEO Buenrostro Indicted Over Apollo Investment, Bloomberg (March 19, 2013), http://www.bloomberg.com/news/2013-03-18/ex-calpers-ceo-buenrostro-indicted-over-apollo-investment.html. See, e.g.,James Kim, Speaking for Shareholders: CEO of CalPERS Wields Clout, USA Today (Feb. 23, 1993). See Steven Malanga, The Pension Fund That Ate California, City Journal, Winter 2013, available at http://www.city-journal.org/2013/23_1_calpers.html. See Reuters, Largest Pension Fund Adopts Social Responsibility Standards, Houston Chron. (Nov. 15, 2000). See Malanga, supra note 34. See id. ; see also Judy Lin, Largest public pension fund earns dismal 1%, Associated Press (Jul. 17, 2013), http://usatoday30.usatoday.com/money/perfi/retirement/story/2012-07-16/California-state-pension-fund/56256380/1. See Dan McCrum, Calpers to awaken zombie boards, Fin. Times (Apr. 7, 2013), available at http://www.ft.com/intl/cms/s/0/8632b21e-9f75-11e2-b4b6-00144feabdc0.html#axzz2U3lrFQ8T. See, e.g., Business Roundtable & Chamber of Commerce of the U.S. v. SEC, 647 F.3d 1144, 1152 (D.C. Cir. 2011), http://www.cadc.uscourts.gov/internet/opinions.nsf/89BE4D084BA5EBDA852578D5004FBBBE/$file/10-1305-1320103.pdf (citing proposition that “unions and state and local governments whose interests in jobs may well be greater than their interest in share value, can be expected to pursue self-interested objectives rather than the goal of maximizing shareholder value”). Pub. L. No. 93-406, § 514, 88 Stat. 829, 897 (1974) (codified at 29 U.S.C. §§ 1001-1461 (2006)). 29 C.F.R. § 2509.08-2(1) (2008). See Business Roundtable, supra note 41. OIG Department of Labor Report, Proxy-Voting May Not Be Solely for the Economic Benefit of Retirement Plans, Rpt. No. 09-11-001-12-121, intro (March 31, 2011), http://www.oig.dol.gov/public/reports/oa/2011/09-11-001-12-121.pdf (questioning whether labor pension funds are using “plan assets to support or pursue proxy proposals for personal, social, legislative, regulatory, or public policy agendas”). See, e.g., David F. Larcker and Brian Tayan, Union Activism: Do Union Pension Funds Act Solely in the Interest of Beneficiaries?, Stanford University Closer Look Series No. CGRP- 30 (Dec. 11, 2012); Tracie Woidtke, Agents Watching Agents? : Evidence from Pension Fund Ownership and Firm Value, 63 J. Fin. Econ. 99 (2002) (finding that evidence is “consistent with the view that [public pension fund] administrators’ actions may be motivated more by political or social influences than by firm performance”); cf. Copland, supra note 3. See, generally, Public Sector Inc., http://www.publicsectorinc.org/forum/ (last visited May 22, 2013); see also Thomas Fitzgerald, Underfunded public pensions: A ticking time bomb, Phila. Inquirer (May 18, 2013), available at http://articles.philly.com/2013-03-18/news/37789866_1_pension-systems-pension-python-pension-funds; Andy Kessler, The Pension Rate-of-Return Fantasy, Wall St. J. (Apr. 9, 2013), available at http://online.wsj.com/article/SB10001424127887324100904578403213835796062.html. See Susan Edelman, NYC pension funds big Liu-sors, N.Y. Post (Dec. 30, 2012), available at http://www.nypost.com/p/news/local/nyc_pension_funds_big_liu_sors_TjuluHIU80KVOmpQppiLpM. See E.J. McMahon, McMahon: Taxpayers lose in pension gamble, Newsday (May 30, 2012), http://www.newsday.com/opinion/oped/mcmahon-taxpayers-lose-in-pension-gamble-1.3750910. See Office of the State Comptroller, Snapshot of the New York State Common Retirement Fund, http://www.osc.state.ny.us/pension/snapshot.htm (last visited May 22, 2013). See Freeman Klopott, Cuomo Plan to Curb Pension Costs Dropped Under Pressure, Bloomberg (Mar. 22, 2013), http://www.bloomberg.com/news/2013-03-22/cuomo-plan-to-curb-pension-costs-dropped-under-pressure.html. See Stuart Pfeifer, CalPERS gains more than 13% in investment returns in 2012, L.A. Times (Jan. 15, 2013), available at http://articles.latimes.com/2013/jan/15/business/la-fi-calpers-return-20130115. See Michael Schlachter et al., California Public Employees’ Retirement System: Performance Review – December 31, 2011, 20 (2011), available at http://www.calpers.ca.gov/eip-docs/about/board-cal-agenda/agendas/invest/201204/item06a-04.pdf. See Bloomberg, CalPERS contributions could rise 50% in plan to plug funding gap, Pensions&Investments (Apr. 16, 2013), http://www.pionline.com/article/20130416/DAILYREG/130419912. See Woidtke, supra note 46. See Robert Steyer, New York review concludes state pension fund "thinly staffed", Pensions&Investments (Feb. 19, 2013), http://www.pionline.com/article/20130219/DAILYREG/130219885.